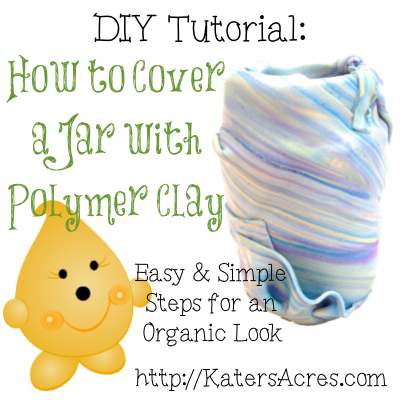 This polymer clay tutorial will teach you how to take a glass jar and cover it will polymer clay to give an organic and “rustic” look to your design. Gather your polymer clay in any color you wish for your background. Take your clay and organize them into a log with colors alongside each other. Twist and roll your log. Do this many times to achieve a nice color blend. Feel free to repeat this process, but do not over blend or you will create mud. Cut out your clay in sections to show off the most interesting blends. Place your cut pieces of clay over your jar making sure to cover the rim. Add any decorations that you would like to enhance your jar. See the tutorial to add Koala’s in the Christi Friesen style from the Friesen Project. Bake in an oven covered with foil at 265 degrees for 60-75 minutes. Don’t forget to SIGN UP to get more FREE tips, tricks, & tutorials in your email! Do NOT blend all your seams. Create folds in the clay. Create pockets in the clay where things can “grow” or “bloom” out of. Use the most “interesting” patterns that emerge from the clay to give your jar character. Here’s what I did with my jar…. I WOULD LOVE TO WORK WITH POLYMER CLAY WITH MY OLDE GRANDCHILDREN. MAYBE MAKE TINY THINGS OR WEIRD THINGS IN A JAR OF INK WATER.